The Hawaii Mars could receive flight orders as early as July 7, Mayor Mike Ruttan said after taling with the Minister Steve Thomson. Jul. 7, 2015 1:00 p.m. The Hawaii Mars waterbomber was lowered onto the water the morning of July 7. 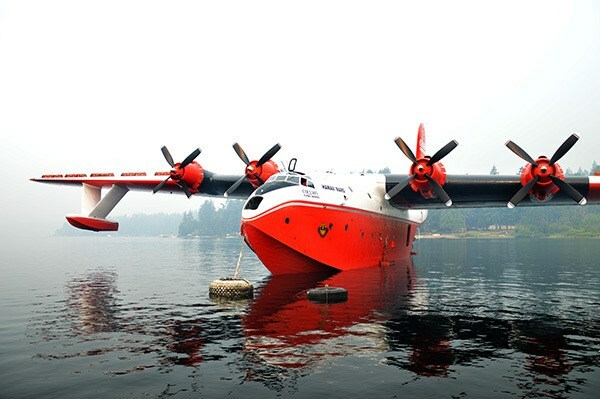 The Hawaii Mars could receive flight orders as early as later today (July 7), Port Alberni Mayor Mike Ruttan said following a conversation with the Minister of Forests, Lands and Natural Resource Operations Steve Thomson. Coulson Group CEO Wayne Coulson told the News he hadn’t heard confirmation yet. However, the Hawaii Mars has been added onto the standing offer contract with the B.C. government. If the Coulson’s fire fighting fleet is needed, then having contracts signed allows them to get into the air and on the scene faster. While Coulson said he’ll talk to B.C. first, if the Mars isn’t needed here then it will go elsewhere. While Coulson hasn’t received marching orders for the Mars yet, he said that if it is utilized by the B.C. government it will likely fly in the same areas it has historically. The Mars was lowered into the water around 10 a.m. on July 7, just one day earlier than planned for the Chinese government test pilots coming in to train on it. Flight tests will begin tomorrow and the Mars should be fully operational by Thursday. The Hawaii Mars’ firefighting capabilities will also be tested. A request for comment from the Ministry of Forests, Lands and Natural Resource Operation has not yet been returned.